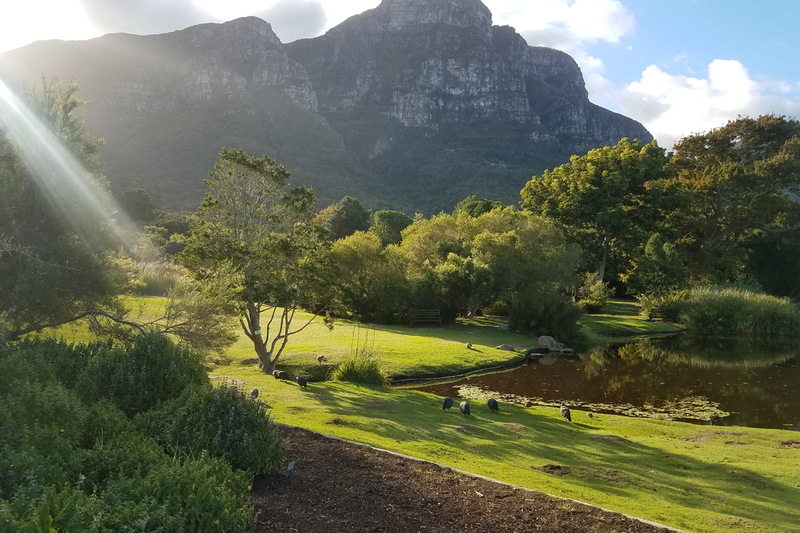 Saint Mary's College is offering the South Africa program in Cape Town, South Africa in coordination with ISA (International Studies Abroad), a non-for-profit educational organization. The host intuition is the University of the Western Cape. Click for more information about ISA Cape Town Program. South Africa is the second largest country in Sub-Saharan Africa, about twice the size of Texas, with a population of over 50 million (1/7 of the US). The diversity in South Africa is unparalleled with 11 official languages and an Indian population second largest in the world only to India. South Africa houses Kruger National Park of over 7,500 square miles as well as many other parks where the Big 5 can be spotted! Over 2,000 miles of beaches that touches the Indian Ocean on the east and the Atlantic towards the west. Diverse populations, gorgeous diversity of landscapes ranging from mountains to beaches, wildlife, flora and modern international cities makes South Africa one of the most unique study abroad destinations that Saint Mary’s offers! Located at the University of the Western Cape, the Tygerberg suburb of Belleville is just 12 miles north of Cape Town. Its attractive campus includes an important nature reserve, and the mountains of the Cape Peninsula and Stellenbosch provide beautiful landmarks to the east and west. Most of the major cultural or recreational facilities of Cape Town and Stellenbosch are within half an hour’s drive. Known as the “Mother City”, Cape Town was founded in 1652 and is South Africa's oldest city. Cape Town is rated as one of the most beautiful cities in the world with a backdrop of flat-topped Table Mountain juxtaposed by the sweep of the Atlantic Ocean in the foreground. You can hike or take a cable-car ride up Table Mountain to enjoy the breathtaking view of the city and peninsula, take a ferry to the historic Robben Island, or visit the Cape of Good Hope. For more information about South Africa, visit the official South African Government Webpage! The University of the Western Cape (UWC) offers courses that will fit into anyone’s area of study. Students can choose courses taught in English in a wide range of subject areas, including anthropology, sociology, English, African languages, history, political studies, women’s and gender studies, nutrition, psychology, sports, business, accounting, economics, education, biology, chemistry, earth science, environmental studies, mathematics, physics, and international studies. It is suggested that students take 4 courses or the equivalent of 16 credits while enrolled in the University of Western Cape. A Saint Mary’s College faculty coordinator will work with students to find courses from the vast variety of courses that UWC offers. A complete list of course offerings can be found at the ISA Cape Town Webpage or The Official UWC Webpage. Because South Africa is located in the Southern Hemisphere, our semesters are aligned in reverse order. For example, Spring Semester at Saint Mary’s aligns with UWC Semester I. Semester programs and full year programs are available. Students participating in Saint Mary's international programs will receive an official Saint Mary's transcript for courses taken abroad. University of the Western Cape will send official grades to ISA and then to Saint Mary's and we will issue official transcripts. For Notre Dame students, these credits will appear on ND transcripts as any on-campus Saint Mary's course does through our co-exchange agreement. Before leaving for international study, Saint Mary's College faculty coordinators will provide assistance in pre-approving transfer credits. The program offers some excursions covered by the program fee, including a one-day trip to Table Mountain and Cape Peninsula, Aquilia Game Reserve, multiple days to the Hermanus Backpacker Lodge, and an one-day trip to Langa Township and Robben Island, where Nelson Mandela was imprisoned for 18 years. Students will be housed in double rooms with shared kitchen and bathroom facilities in a dorm, which is about 35 minutes away from UWC via public bus. Students are given a monthly stipend. This stipend can be spent on groceries to cook, or for meals at local restaurants. UWC’s campus does not have a formal dining hall, but there are areas on campus to purchase meals. Upon arrival, students will participate in arrival orientation led by the ISA resident advisor before the university orientation for new students, in which they will be introduced to the campus community, familiarized with local customs, given information regarding getting involved in student activities on campus, presented with volunteer opportunities, and visit local attractions in Cape Town. The tuition for this program for Saint Mary's students is the Saint Mary's College tuition, room and board, and fees. The program cost includes 12-16 credits, arrival orientation, excursions/field trips, on-site campus housing, and meals. Airline flight to South Africa is not included in the price. Students who receive the federal Pell Grant are strongly encouraged to apply for the federal Gilman Scholarship. Please click HERE for more information. This program is open to undergraduate sophomores, juniors and seniors. Students wishing to participate in the program must have a minimum 3.0 GPA. It is expected that the student will be in good disciplinary standing at the College and exhibit the emotional maturity and adaptability to new experiences.